The Most Effective Dog Training in New Hampshire and Massachusetts! 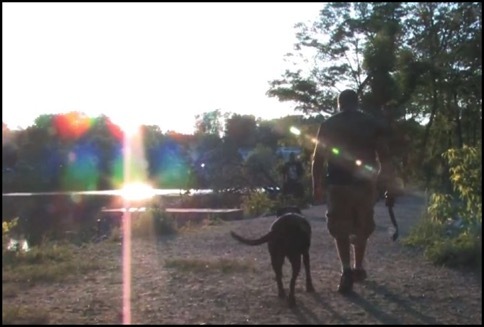 Matt and his dog Brady take an off-leash hike in Haverhill, MA. To make people feel more comfortable that a dog is permitted to be off-leash (and presumably to let authorities know when one isn’t), off-leash dogs in Newton parks are required to wear a resident or non-resident off-leash medallion. Handlers must wear a “Professional Dog Walker” medallion. Those walking their dogs in off-leash parks are required to keep their leashes with them and keep their dogs under voice control and in their sight at all times. Whether your city uses a permit system like Newton or a schedule system like Arlington, the common thread is that these dogs need to be social and have solid off-leash obedience training. Dog owners in MA and Southern NH can contact us today to set up a training consultation. Check out our programs for off-leash obedience, puppy obedience basics and behavior modification to get your dog ready to join the fun! Don’t forget that First Choice Canine is certified for the AKC’s Canine Good Citizen program and would be happy to work with you and your dog.